Turkish President Recep Tayyip Erdogan is in Moscow for talks with his Russian counterpart Vladimir Putin. The visit comes as Turkish forces are poised to launch a major military operation against the Syrian YPG Kurdish militia. “We will not seek advice on how to deal with a terrorist group from anyone whose activities have been directed against our citizens for more than 30 years, or ask for permission to fight terrorism,” Erdogan wrote last week in the Russian daily Kommersant. 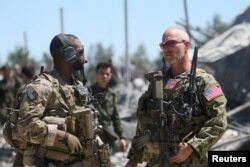 FILE - U.S. forces are seen at the Kurdish People's Protection Units (YPG) headquarters after it was hit by Turkish airstrikes in Mount Karachok near Malikiya, Syria, Apr. 25, 2017. Putin gave the green light to two previous Turkish military operations against the YPG, resulting in a wide area of Syria coming under Ankara’s control. International relations professor Huseyin Bagci of Ankara's Middle East Technical University Analysts suggested Erdogan will be seeking to change Putin’s mind. Moscow’s leverage over the YPG and PYD is enhanced with U.S. President Donald Trump’s decision last month to withdraw from Syria and end American military support of the militia in the war against Islamic State. Putin is also aware that Trump’s decision to pull out of Syria denies him a key card in his efforts to drag Erdogan away from his traditional NATO ally. Washington's support of the YPG, considered terrorists by Ankara, had poisoned bilateral relations. “The two leaders agreed to continue to pursue a negotiated solution for northeast Syria that achieves our respective security concerns,” the White House said. 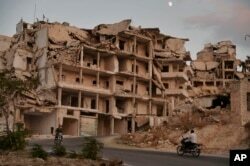 FILE - In this Sept. 20, 2018 photo, motor cycles ride past buildings destroyed during the fighting in the northern town of Ariha, in Idlib province.